A couple of interesting pieces of DLC are headed to cute, casual, and co-op friendly LittleBIGPlanet. 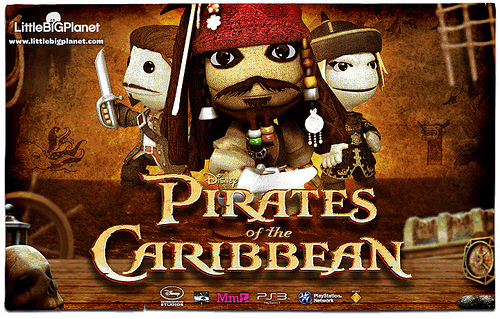 The first is the Pirates of the Caribbean costume pack. The pack has six costumes for $5.99, including an adorable "Sack Sparrow" and squid-faced Davey Jones. If you're short on treasure, the six costumes will be available separately for $1.99 each. Of course, every good pirate ship needs an ocean to float in, and it's finally available for LBP in the Water Level Kit. This DLC will set you back just a few dubloons at $5.99, and includes five new water-based levels, a mini-game, a costume, and lots of stickers, objects, and trophies. Yup, your Sack people will be able to swim now. Should be interesting to see what folks come up with with the new water tools! LittleBigPlanet - Censored, Respectful, or Something Else? Page created in 0.3676 seconds.